Kitten with a Whisk: Genius or Insane? You can hate me for saying this…but I would try the Fried Cheese Melt at Denny’s. And honestly, it wouldn’t have to be at 4am with me a little lot drunk either. I like to live dangerously. Still, what’s not to like here? - Grilled cheese? Even better. Well maybe not even better but still good … fried almost always trumps grilled in my opinion. Denny’s did get something wrong though. The Fried Cheese Melt is served with a side of marinara sauce. That is the one thing that I find gross about the dish – the marinara sauce. To me it is such an absurd idea because this sandwich calls for Ranch dressing and nothing else. I am totally feeling the marinara. Love the new blog look! Lots of fried goodness here. Wow! 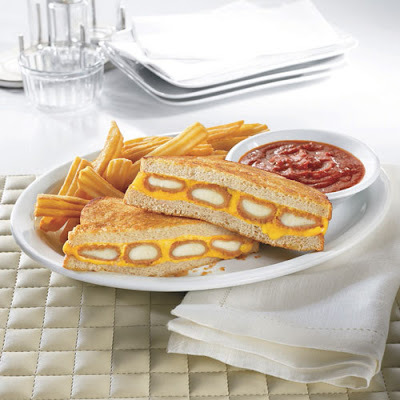 This is totally new to me and I'd like to try the fried cheese melt,but unfortunately won't be able to as there are no Denny's where I live (U.K). Not sure about the marinara sauce. Wow! You should submit this to This is why you're fat, lol. @Chasing - You know I actually thought about submitting it. I love that blog and its exactly the type of food you'd find there.